'Time For Us Tonight' dedicated to my lovely wife Maria. 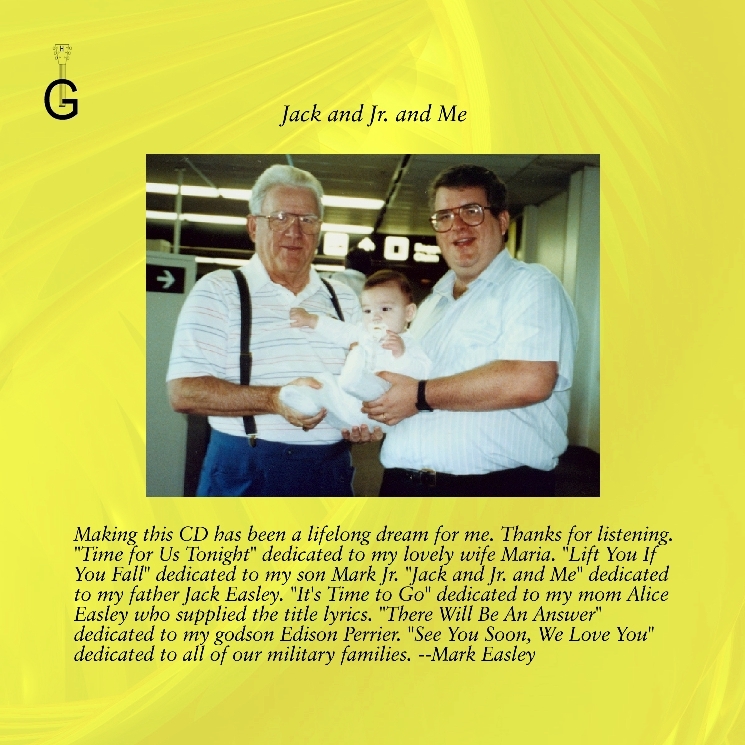 'Lift You If You Fall' dedicated to my son Mark Jr.
'Jack and Jr. and Me' dedicated to my father Jack Easley. 'It's Time to Go' dedicated to my mom Alice Easley who supplied the title lyrics. 'There Will Be An Answer' dedicated to my godson Edison Perrier. 'See You Soon, We Love You' dedicated to all of our military families. Click on the Buy CD logo to learn how to buy this CD. You can purchase and download individual tracks from zune or iTunes. You can also listen to mp3s of the highlighted songs in the song list at left. 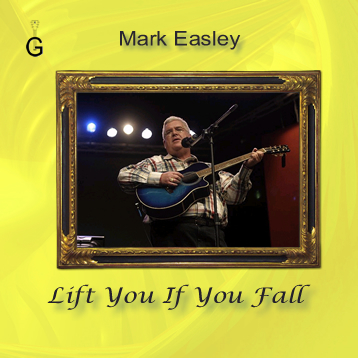 Vocals, guitars, bass and keyboards by Mark Easley. Produced and engineered by Rufus Dickerson and Mark Easley at GoldHat Music, Morrisville, NC USA. Sequenced and Recorded on Sonar. 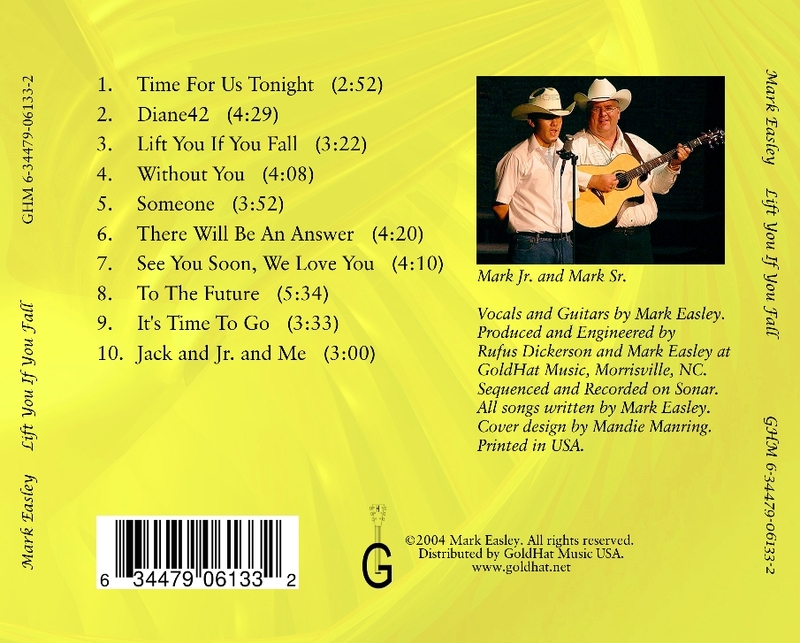 All songs written by Mark Easley. Cover Design by Mandy Manring. © 2004 Mark Easley. All Rights Reserved. Guitars: Guild D25, Martin 000-16, Guild F50, Sigma AE, Dean Exotica RSE, Fender Strat, Dean 6-string banjo, Ibanez classical, Ovation Celebrity, Takamine 12 string, Yamaha bass and Yamaha keyboard. Mark sings "Lift You If You Fall"
"I listened to your CD a little while ago and have been meaning to tell you how much I enjoyed it and how impressed I am with the production quality. I also love the fact that it’s a family effort!" "I am here in Hong Kong and working on my computer listening to your MP3 songs. I just wanted to tell you that I am thoroughly enjoying listening to your music. A true gift and heart felt activity by you that comes thru." "I hear your heart and soul in the tunes. How nice that you not only can play, but you also record so nicely. The recording is very professional." "Hey Mark....just wanted to let you know how much I've enjoyed your CD. This is one I can sing along with..unlike the stuff my kids listen to!" "I must say too that I listened to your entire CD when I drove to my appointment in High Point!... You have a very soothing voice and style...good to listen to in rush hour--mitigates road rage!! Your themes were positive, uplifting and called for personal responsibility--something neat in today's day and age." For my wife Maria. No matter how busy life gets, we still make time to support each other. Mark Jr. created the drum track for this song. What if a guy was looking for his old girlfriend on Google? For my son Mark Jr. Raising a child is the most important thing in life. I think everyone has had the experience of leaving someone behind and then regretting it later. Someone pulls the wagon, while someone else only wants to ride along. Many couples have struggled with making a baby. That makes God's gift all the more appreciated. Dedicated to all of our military families. We don't often appreciate what they are going through. Circle of life, American style. Some of us have the urge to see the world, while others like where they are just fine. 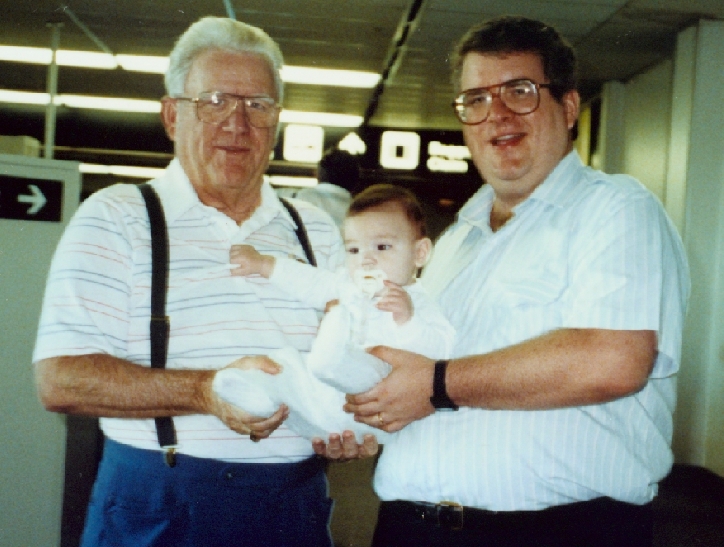 Dedicated to my late father Jack Easley, and based on the photo at left. Mark sings "Time For Us Tonight"